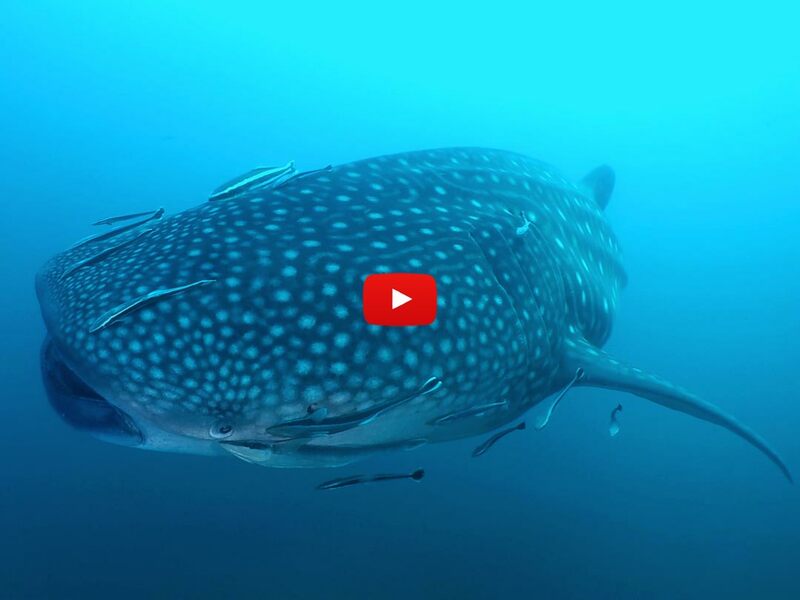 Get the most out of your diving experience by joining a Similan diving day trip in the crystal clear waters of the Andaman Sea. The Similan Islands are a 24 km long chain of nine islands and several rocks, located 70 km off the coast of Khao Lak, Phang Nga Province, and declared a Marine National Park in 1982, covering an area of 70 km2 (the marine park was expanded in 1989 to include the two solitary islands of Koh Bon and Koh Tachai, covering now 140 km2 with a land mass of about 26 km2). While ‘Similan’ is a Malay word that simply means ‘nine’, all the islands have distinctive Thai names, but usually, they are referred to by their number, counting the islands from south to north. Similan Island National Park is famous for its dive sites. It has typically two different kinds of diving: East side diving consists of gently sloping coral reefs and sandy patches with the occasional boulder in-between. The corals come in several shapes and forms, like staghorn, leafy, brain, mushroom, whip, table, maze and pore coral, to name a few. Not to forget the giant sea fans, gorgonians, colourful soft corals and anemones. The west side is known for its huge underwater granite boulders with numerous swim-throughs. This fascinating underwater landscape attracts a huge variety of marine life, from tiny creatures like shrimps, crabs, clownfish, pipefish and sea horses, big schools of tropical reef fish, butterfly fish, angelfish, bannerfish, snappers, scorpion fish, trevallies, groupers, barracudas, moray eels and octopus to different sharks and triggerfish, stingrays, turtles, giant manta rays and majestic whale sharks. Water clarity is excellent, and the scenery varies with each Similan Island. Elephant Head Rock is arguably the most famous west side dive site with a maze of swim-throughs and the reputation for spin-cycle like currents running in every direction. 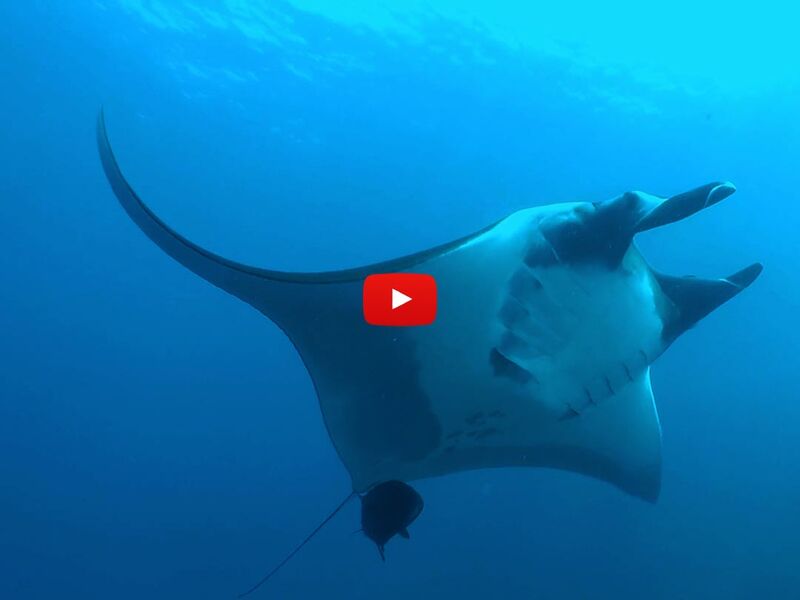 Other popular dive sites include North Point, Deep Six, Boulder City, Sharkfin Reef, West of Eden, East of Eden, Anita’s Reef, Breakfast Bend and Christmas Point. 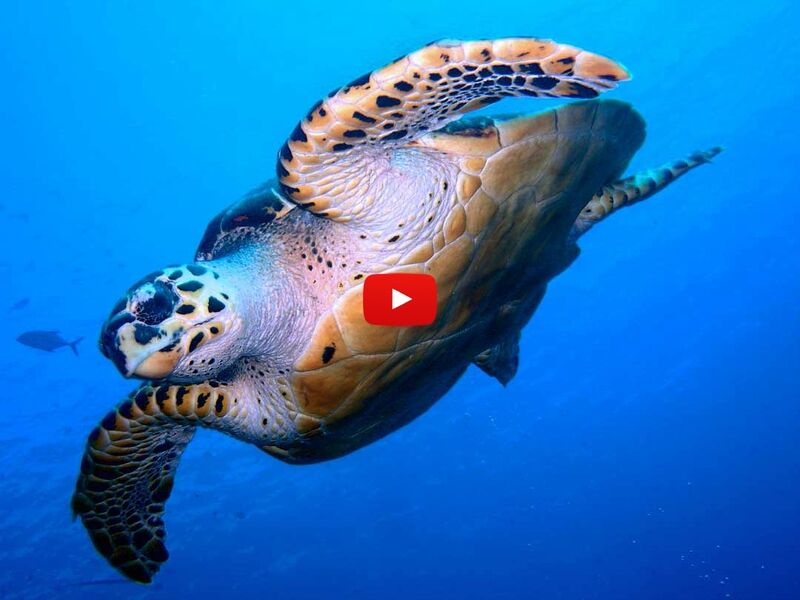 Some of the Similan Islands (No.1, 2 and 3) are closed to the public all year round due to a turtle hatching protection program and reef conservation efforts. Island number 3 belongs to a Thai princess. 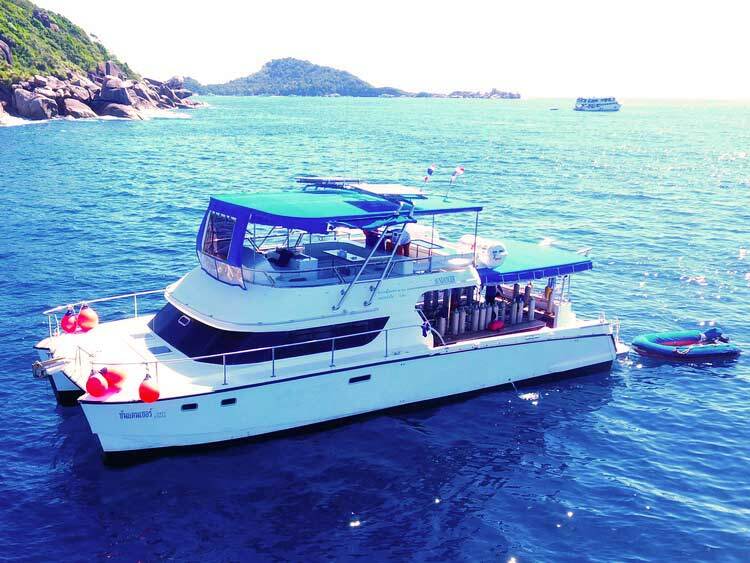 The daily Similan diving day trip is made with the brand new, custom-built high-speed Catamaran MC Sundancer, which brings you to your dive sites in just 1 1/2 hours. The comfortable boat guarantees stability in the water and has an expansive dive deck and a cosy salon. The onboard kitchen offers delicious breakfast and lunch buffet style on every trip; snacks and fresh fruit is served after the last dive on your way back to Khao Lak. 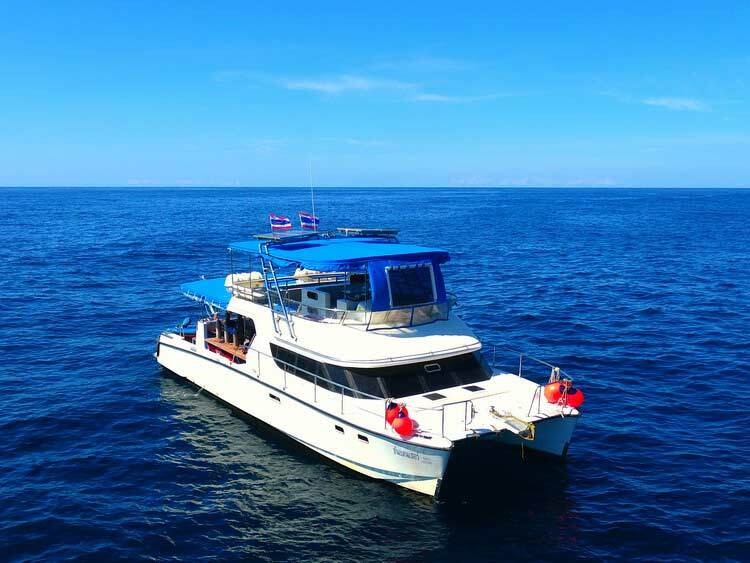 On this Similan diving day trip, you are doing two dives of 45 to 60 minutes with a maximum of 4 divers per experienced dive guide. Each Dive Master gives a detailed dive briefing to his group and helps you with setting up your diving gear. 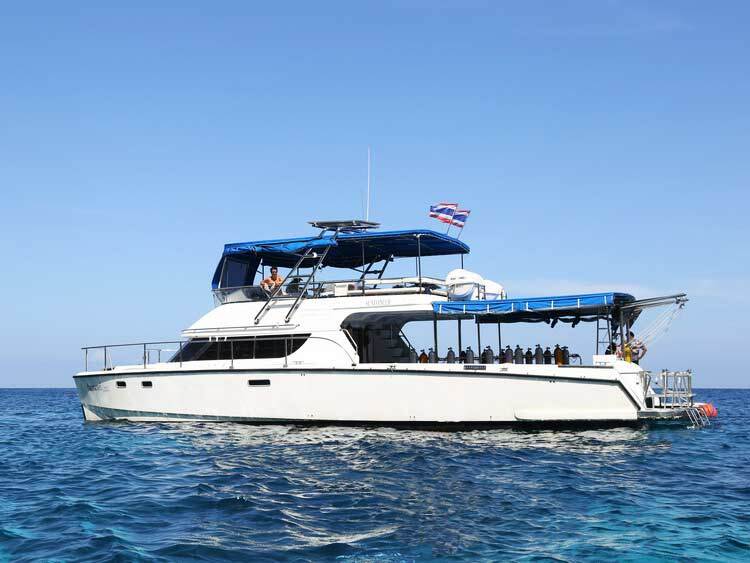 At 9.00 AM the catamaran MV Sundancer leaves to the Similan Islands from Khao Lak jetty. The travel time is around 2 hours. 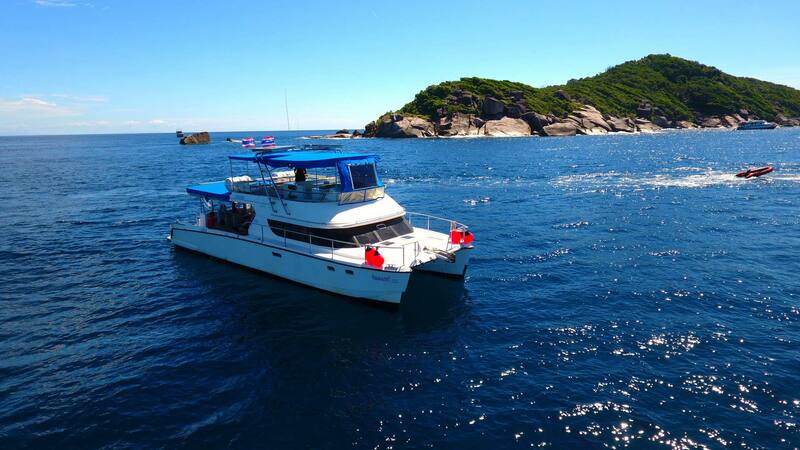 The friendly and experienced crew welcome you onboard on the comfortable dive boat. The boat master gives a short boat briefing before you enjoy a nice coffee and a European breakfast. Back onboard a fresh made delicious Thai and Western style lunch is served. In the meantime, the boat heads to the next dive site. During the surface interval there is plenty of time to relax or to sunbathe on the spacious sundeck. Arriving at the second dive side, your Dive Master gives a detailed dive briefing and will help you with gearing up. After the last dive snacks and fresh fruit are served. M/V Sundancer starts returning back to Khao Lak. This will give you enough time to fill in your logbook, exchange experiences, enjoy the scenery and have a drink The arrival time is around 17.00 PM . 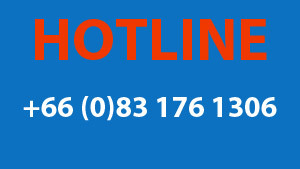 A taxi is waiting to bring you back to your accommodation in Khao Lak. Monday Similan islands no 4,5,6 Monday is dedicated to snorkelers, courses and beginners.